Background: One of the processes leading to education and evaluation promotion in nursing is mentoring. Moreover, using a portfolio leads to promotion of the mentoring process. Due to the importance of mentoring in nursing, its strengthening by the portfolio, the weakness of mentoring in nursing, and the lack of widespread use of portfolio in nursing education, the aim of this study was to determine portfolio content, which can help the mentoring performance. Materials and Methods: The present scoping review study was conducted in 2017. Articles were searched using the keywords portfolio, mentoring, nursing education, logbook, teaching, learning, nursing, education, and evaluation. The search was conducted in SID, IranMedex, IranDoc, Magiran, PubMed, Google Scholar, Scopus, Web of Science, and ScienceDirect databases. Studies published in Persian and English from 1997 to 2017 were reviewed. The studies were extracted based on the inclusion and exclusion criteria. Results: Of the 1070 articles searched, 6 were extracted for the final assessment. The results indicated that a portfolio consists of a title page, content list, introduction, record of experience, mentor's feedback and comments, self-evaluation, and educational activities. Furthermore, nursing process is required to help conduct mentoring among nursing students. Conclusions: Recording experiences, feedback, etc., in the portfolios of nursing students can be helpful in conducting mentoring for student's education. It is suggested that educational managers perform mentoring in educational environments using the contents suggested in this study. Mentoring is a bilateral and useful process, in which a mentor guides a mentee. In this regard, a mentee's ideas and talents are nurtured and flourished by a mentor, and finally, lead to the mentee's professional and personal progress. The mentoring process reduces distance between theory and practice, increases self-confidence, improves the quality of patient care, promotes critical thinking, active learning, and spiritual support, and increases interactions between students. In reality, in addition to the teaching role, a mentor is responsible for providing counsel, information, and emotional support during a period of time. Moreover, in nursing, the mentoring process is undertaken with the aim of improving student–mentor and student–students communication, decreasing stress and anxiety, and promoting collaboration and communication as well as responsibility skills. Despite the importance of mentoring in nursing education, very few studies have been conducted in this regard. Many nursing students perform their activities under the observation of a mentor without being aware of it. Nursing teachers believe that mentoring is one of the most effective and correct methods for education and experiences transference, but this method is not well-known and not widely implemented in nursing. Currently, mentoring is a formal and customary process in nursing and is used in most nursing programs for strengthening teachers and students. On the one hand, a large part of the nursing education takes place in practice and in the clinical environment. Mentoring is also important in this environment, as it helps transfer knowledge and experiences to the student. Today, learning clinical skills is taken into consideration as much as theoretical learning in nursing. On the other hand, education and evaluation are as important as the activities of a profession; therefore, more appropriate tools should be used for them. Using performance tests and tools such as identification test, work sample, simulated performance, direct observational skill test (DOPS), and portfolio, which directly measure learning processes and products, is recommended in nursing education. Among these tools, portfolio is performed to meet two goals; provide the best work and show the learner's educational growth. In addition to emphasizing educational growth and learning progress, portfolio emphasizes on guiding students' learning and thinking as well as self-evaluation. Portfolio is an appropriate tool for education and evaluation. It has been used as a method for demonstrating nursing competency for 25 years., Portfolio is a set of evidences and documents which show that learning is occurring. The word was first used by Portare Fogliou and means to carry paper. The portfolio is a set of tasks related to the students' actions. It is applied as an approach for integration of theory and practice and developing the nursing profession. The portfolio has been used to show students' learning and growth and to motivate them at excellent levels and undergraduate levels; it is also used as a tool for summative and formative evaluation. In fact, the use of portfolio in nursing goes back to the Florence Nightingale School. Hoshyarikhah, Habibzadeh, Latifi, Banejad, Asadi, Zare, Kouhpayezadeh, McMullan, Karsten, Forte, Sara Ross, Mills, Missi Stec, Willmarth-Stech, and Bernard  have used portfolio in nursing in their studies. They studied clinical competence and its promotion, change of perceptions in the clinical environment, satisfaction level and academic achievement, clinical learning, clinical competency promotion, achievement of a standard educational method, and nursing students' attitude after using the portfolio. No mention was made of the elements and structure of a portfolio in these studies. Most evaluation methods used in medical and nursing education, such as portfolio, due to the incompatibility of the content with the predefined goals, are not assigned by teachers and student to predefined goals. Portfolio was designed in the Baqiyatallah University of Medical Sciences↱, Iran, because it was not previously used. The designing and implementation of the portfolio was carried out in the faculty of nursing on the order of the deputy of education and head of the faculty. Having a clear guide, determined aims, and suitable content and structure are necessary for achieving success in using the portfolio. The appropriate and user-friendly design of a portfolio is also one of the important principles in its usage. Studies that have used a portfolio made no mention of the structure of a portfolio and strengthening the mentoring process by using it. Considering the above issues regarding a portfolio and the importance of using standard and comprehensive content in a portfolio, the aim of this study was to determine the structure and content of the portfolio which can help the mentoring process. The present scoping review study was conducted in 2017. There are some differences between a scoping review and systematic review. All these studies begin with a main question which is the core of the study. In comparison to a systematic review, the research question is more general in a scoping review. Furthermore, a scoping review is more flexible than a systematic review. Researchers have mentioned the scoping review stages as identifying and presenting the main research question, identifying the related studies, choosing appropriate studies, creating a data chart, collecting, summarizing, and reporting data, and consultation (an optional stage). The main question was: “What is the structure of the portfolio that can help the performing of mentoring?” Articles in this regard were searched in accordance with MeSH using the keywords portfolio, mentoring, nursing education, logbook, teaching, learning, nursing, education, and evaluation. The above keywords were searched separately and in combination with OR/AND operators in the databases and search engines of SID, IranMedex, IranDoc, Magiran, PubMed, ScienceDirect, Scopus, Google Scholar, and Web of Science. The study inclusion criteria consisted of studies which examined the portfolio or logbook in nursing, provided an introduction, definitions and explanation about aims, elements, dimensions, and educational and evaluation models with an emphasis on mentoring and portfolio, acquired acceptable grades in qualitative assessment of articles in Strengthening the Reporting of Observational studies in Epidemiology (STROBE) and Preferred Reporting Items for Systematic Reviews and Meta-Analyses (PRISMA); and were published in English and Persian from 1997 to 2017. Studies that included a short report, book review, introduction, editorial report, preface, introduced books, and magazines, and included a meetings report were excluded from the study due to their lack of ability to answer the research question because of being limited and also due to lack of qualitative evaluation. The search was conducted using the mentioned keywords in the related databases from 1997 to January 2017. In the first stage, 7616 articles were searched in the related databases. Repetitive articles were deleted and removed. At the end of this stage, 1070 articles remained. The titles of the articles were carefully examined in the next stage. Articles that were not relevant to the main question and could not answer the question were removed from the study. Finally, 287 articles were included in the study. The summary of the remaining articles in the last stage were carefully studied twice. Articles which could not answer the main question of the study were removed at this stage. At the end of this stage, 58 articles remained; their original articles were required for the review. The full text of the articles was retrieved and reviewed. After reviewing and studying the full and accurate text of the final articles, six articles, which could answer the main study question, were selected for the study [Figure 1]. The researchers tried to act in an unbiased analysis of information. Appropriate research method was selected. All relevant studies were attempted to be included in the study. Among 7616 retrieved articles, only 58 were fully assessed and reviewed and only 6 were extracted after using STROBE and PRISMA. The articles had to earn at least 70% compliance in these two checklists to be included in the study. The STROBE criterion is used to select appropriate observational studies. The results of the data analysis [Table 1] indicated that a portfolio structure and content include various items. 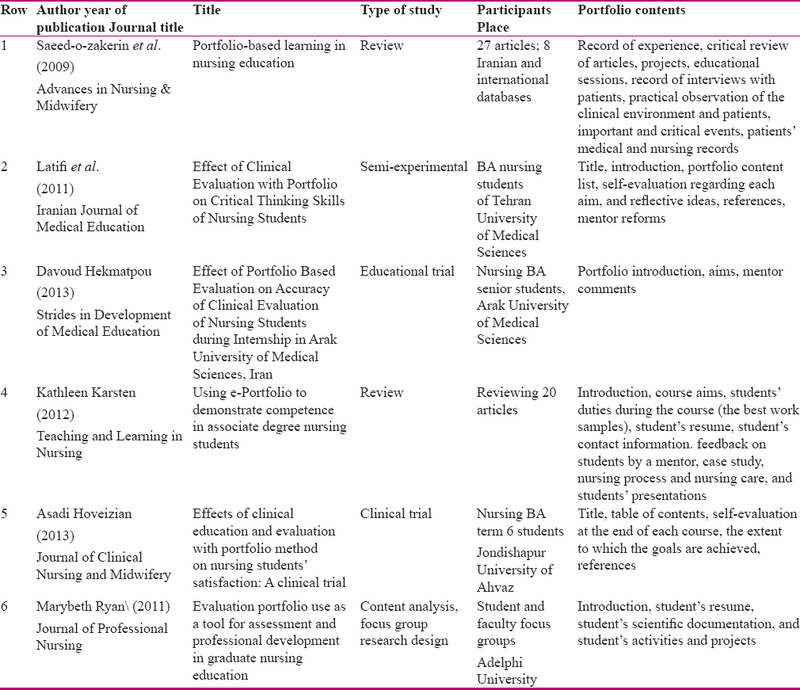 Portfolio structure and content in nursing students are different from portfolio introduction, article reviews, educational sessions, mentoring, and recording of educational experiences. There was no mention about the considered structure for a portfolio and the method of performing mentoring in most reviewed studies. Each one of the six final extracted studies had pointed to important structures that can be used in nursing students' portfolios. Saeed-o-zakerin et al. assessed some studies that used portfolio in nursing. They have reported that recording of experience by nursing students, critical review of articles, projects, educational sessions, documenting of interviews with patients, practical observation of the clinical environment and patients, critical and important events, and assessment of medical and nursing documents of patients comprise portfolio structure. Latifi, Hekmatpou, Asadi Hoveizian, Karsten, and Ryan  stated that a nursing portfolio consists of a title, portfolio introduction, content, portfolio references, mentor comment, feedback to the student by a mentor, self-evaluation regarding each aim, mentor reforms, writing a reflective idea, course aims, students' duties page during the course (the best work samples), student's resume, student's contact information, case study, nursing process and nursing care and the student's presentations, self-evaluation at the end of each topic and at the end of the course, the amount of achievement of aims, scientific documentations achieved by the student, and his/her activities and projects. The findings of this study are an example of portfolio structure and content in nursing students. A nursing student's portfolio includes diverse content, but in the present study, the most important structure of a portfolio, which has been applied in studies for educating and evaluating nursing students included the following. The results of the present study indicated that one of the most important parts of a portfolio is the title page, portfolio introduction, and its content list.,,,, Title page and portfolio guide are the most important parts of a portfolio. Studies have indicated that lack of transparency in these leads to confusion and dissatisfaction among students while completing the portfolio., Some studies indicated that the lack of a transparent guide and inappropriate structure of the portfolio causes stress among students and teachers. Students usually attach a photo of themselves to this page. It also includes some information regarding their college such as college special uniforms; other information regarding their college can be recorded on this page. In addition, a brief introduction of the portfolio and its content can be observed on this page. Content, date of placing each item, title, and the aim of placing each item in the portfolio are also considered as the structure of this part of the portfolio. In some studies, education, learning, and teaching styles are considered as a part of the title page. Recording experience in nursing education is considered an important part of a portfolio., A portfolio in practice is the documentation of learning and learning content. Documentation also includes the recording of experiences. Students' and even nurses' recording of experience in a portfolio can play an important role in its successful execution. Recording experience, especially in the clinical environment, includes nursing professional skills, specific experience regarding beginning of drug administration for patients or nursing care provision, reflections on the learning experience, and educational learning-related content such as a case report, conferences, or seminars. A significant point in recording experience is an immediate and accurate documentation in the portfolio. Many factors influence nursing students' professionalism and socialization, especially in clinical environments, but mentoring is one of the most important factors. A mentor's role is very important in the clinical environment as a guide and supervisor in applying theoretical knowledge. Moreover, a mentor can increase practical skills and critical thinking and act as a role model to promote students' professional skills. Nursing students, especially in the clinical environment, tend to have a sense of belonging and enthusiasm towards education by a mentor and teacher. This sense in the students and their mentors leads to promoting interpersonal relationship and increasing mutual satisfaction. A mentors' role in evaluating and educating students can be highlighted by using a portfolio. Helminen showed that nursing students believe that a mentor's evaluation is more fair and consistent. Webb showed that mentoring relations among students in using a portfolio depend on the relationship that a student creates with his/her mentor. Students perform many activities to convince their mentors that they are good students. Nevertheless, several factors such as sufficient preparation and support of a mentor and teacher, portfolio format, and adequate time for monitoring students are important for strengthening the mentor–student relationship. Regarding peer mentoring, Bagherieh showed that mentoring decreases nursing students' stress in the clinical environment. Brody showed that performing a mentoring program is valuable both for the mentor and mentee. Some studies have used mentoring in fields other than nursing; these studies assessed mentoring roles and their promotion. Kalata showed that using a mentoring-based portfolio in pharmacy students increases their self-evaluation skills. The results of the present study indicated that self-evaluation is considered an important component of nursing education and portfolio., Self-evaluation in nursing students depends on their abilities and is a vital part of evaluation. Hadid showed that self-evaluation is highly important in nursing students. He states that self-evaluation depends on a person's age, gender, and beliefs. In his study, it has also been shown that self-evaluation is an effective tool for teaching, and can be specifically effective in promoting education in clinical activities. Kajander et al. showed that self-evaluation is an essential structure in nursing education, and should be performed systematically during the study period. The nursing process is a scientific approach to providing high quality nursing care. Nursing process standardizes and improves nursing care. Previous studies have indicated that the quality of nursing cares and their effects will be increased because of nursing care on the basis of the nursing process. The results of the present study illustrated that the nursing process and its inclusion in the portfolio is useful. Lee et al. used the documentation of the electronic nursing process by the students in their study. Results of their studies indicate that using the nursing process decreases stress and anxiety and increases satisfaction with and effectiveness of students' clinical function. Akbari et al. also used the nursing process in their study. They found that lack of adequate time for performing the nursing process due to plurality of patients, lack of support from authorities for performing the nursing process, assigning non-nursing work to nurses, and high workload impede appropriate performance of the nursing process. Ortega et al. used the nursing process in their study and showed that using the nursing process increases interprofessional relationships and improves care continuity. Although several resources have pointed to the advantages and benefits of this method and are considered in educating nursing courses, it remains at a theoretical level and nursing activities are still carried out traditionally. A limitation of this article was the lack of access to all articles in the scoping review. In this case, an email was sent to the authors and the full text of the article was received. However, in some articles, only the abstract was found. The selection of Persian and English articles was another limitation of the study. In most articles, no mention was made of the components of the portfolio, especially mentoring, and no similar research had been conducted in this regard. The present study highlighted important content that has been applied in the portfolios of nursing students. However, considering the issue of a mentor–student relationship in a portfolio and the necessity of strengthening this relationship, other issues and contents can also be used in nursing students' portfolios. The presence of a mentor alongside nursing students is one of the important factors in nursing education. Nevertheless, in nursing education in Iran, student–mentor and mentoring relationships do not help nursing education processes to the extent possible. Using a standard portfolio can be helpful in this regard. The results achieved in the present study can be helpful in the successful performance of mentoring in nursing. It is suggested that educational authorities perform mentoring in educational environments using the suggested content achieved in this study. The code of the present project is 95-09-000993. The research team would like to thank the Faculty of Nursing and education development center (EDC) in Baqiyatallah University of Medical Sciences. Education development center (EDC) in Baqiyatallah University of Medical Sciences. Mohammadi E, Amini M, Moaddab N, Jafari MM, Farajpur A. Faculty member's viewpoints about the characteristics of an ideal mentor, Shiraz university of medical sciences, 2013. Mag Elearning Distrib Acad 2015;6:20-5. Mirbagher Ajorpaz N, Zagheri Tafreshi M, Mohtashami J, Zayeri F. Mentoring in training of operating room students: A systematic review. J Nurs Educ 2016;5:47-54. Bagheriyeh F, Hemmati Maslek Pak M, Hashemloo L. The effect of peer mentoring program on anxiety student in clinical environment. J Nurs Midwifery Urmia Univ Med Sci 2015;13:648-54. Sardari Kashkooli F, Sabeti F, Mardani H, Shayesteh Fard M. The effect of peer-mentoring program on nursing student's clinical environment stressors. Armaghane Danesh 2014;18:836-46. Karimi Moonaghi H, Yazdi Moghaddam H. Role modeling and mentor in nursing education. Res Med Educ 2014;6:59-71. Banister G, Bowen-Brady HM, Winfrey ME. Using career nurse mentors to support minority nursing students and facilitate their transition to practice. J Prof Nurs 2014;30:317-25. Assadi S, Shariati A, Haghighi S, Latifi SM, Sheini-Jaberi P. Effects of clinical education and evaluation with portfolio method on nursing student's satisfaction: A clinical trial. J Clin Nurs Midwifery 2014;3:70-9. Ahmady S, Asayesh H, Aghaali M, Safaeipour R. A comparison of the effect of clinical evaluation by two methods of electronic portfolio and conventional on the level of student's satisfaction. Qom Univ Med Sci J 2016;9:41-9. Aliakbar S. Measuring and Educational Assessment and Evaluation. Tehran: Nashr e Doran; 2008. Mills J. Professional portfolios and Australian registered nurses' requirements for licensure: Developing an essential tool. Nurs Health Sci 2009;11:206-10. Latifi M, Shaban M, Nikbakht Nasrabadi A, Mehran A, Parsa Yekta Z. Effect of clinical evaluation with portfolio on critical thinking skills of nursing students. Iran J Med Educ 2011;1111:368-81. Hekmatpou D. Effect of portfolio based evaluation on accuracy of clinical evaluation of nursing students during internship in Arak University of Medical Sciences, Iran. Strides Dev Med Educ 2013;10:60-9. McMullan M. Using portfolios for clinical practice learning and assessment: The pre-registration nursing student's perspective. Nurse Educ Today 2008;28:873-9. Haverkamp JJ, Vogt M. Beyond academic evidence: Innovative uses of technology within e-portfolios in a doctor of nursing practice program. J Prof Nurs 2015;31:284-9. Ellis JR, Hartley CL. Nursing in Todays World: Trends, Issues & Management. 10th edition Printed in China Copyright © 2012 Wolters Kluwer Health, Lippincott Williams & Wilkins; 2012. p. 626. Sedaghat S, Hooshyarikhah Z, Cheraghian B, Karimi E. The Effect of Educational Portfolios on Nursing Students Clinical Competence in Abadan University of Medical Science in 2014. Abadan: Abadan University of Medical Science; 2014. Habibzade H, Kazemi N, Mhammadpr Y, Khalkhali H. The effect of portfolio educational plan on the perception of nursing students in a clinical educational environment: Based on dreem model. J Nurs Midwifery Urmia Univ Med Sci 2013;11:14-21. Saeed V, Salarhaji A, Karimi H, Saadarjo A, Banezhad A. Effect of portfolio application on satisfaction and educational achievement of nursing students in psychiatry clerkship. J Med Educ Dev 2016;9:112-21. Zare M, Sarikhani R. The effect of electronic portfolio on nursing students' self-regulation in physiology course. Iran J Med Educ 2016;16:131-7. Kouhpayezadeh J. Clinical assessment methods in medical sciences universities of Tehran – Clinical instructors' viewpoint. Hormozgan Med J 2012;16:395-402. Karsten K. Using ePortfolio to demonstrate competence in associate degree nursing students. Teach Learn Nurs 2012;7:23-6. Forte M, de Souza WL, da Silva RF, do Prado AF, Rodrigues JF Jr. A ubiquitous reflective e-portfolio architecture. Int J Med Inform 2013;82:1111-22. Ross S, Maclachlan A, Cleland J. Students' attitudes towards the introduction of a personal and professional development portfolio: Potential barriers and facilitators. BMC Med Educ 2009;9:69. Stec M, Garritano N. Portfolio implementation as a means for achievement of standards. J Res Pract Coll Teach 2016;1:1. Willmarth-Stec M, Beery T. Operationalizing the student electronic portfolio for doctoral nursing education. Nurse Educ 2015;40:263-5. Garrett BM, MacPhee M, Jackson C. Evaluation of an eportfolio for the assessment of clinical competence in a baccalaureate nursing program. Nurse Educ Today 2013;33:1207-13. Peterson J, Pearce PF, Ferguson LA, Langford CA. Understanding scoping reviews: Definition, purpose, and process. J Am Assoc Nurse Pract 2017;29:12-6. STROBE Statement – Checklist of Items that should be Included in Reports of Observational Studies. Available form: https://www.strobe-statement.org/index.php?id=available-checklists. [Last accessed on 2017 Oct 21]. Moher D, Liberati A, Tetzlaff J, Altman DG; PRISMA Group. 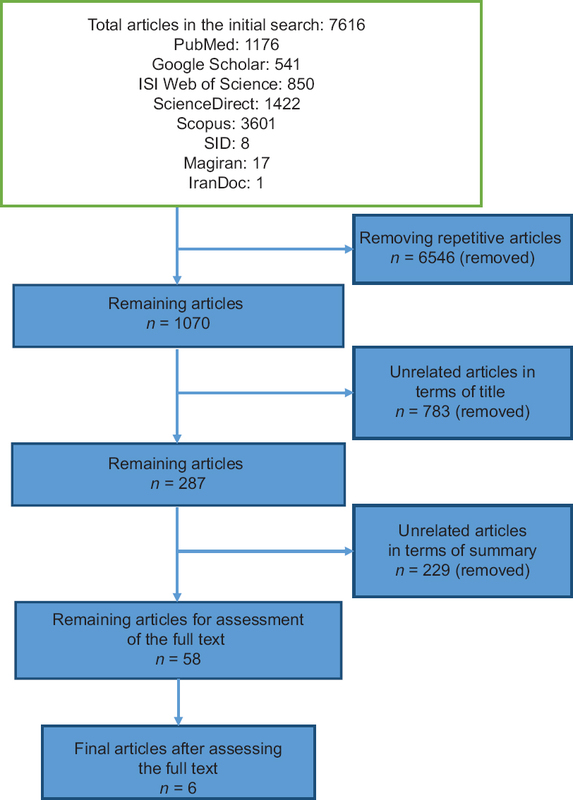 Preferred reporting items for systematic reviews and meta-analyses: The PRISMA statement. Ann Intern Med 2009;151:264-9, W64. Saeed-O-Zakerin M, Markani AK, Markani MK. Portfolio-based learning in nursing education. Adv Nurs Midwifery 2009;19:43-9. Ryan M. Evaluating portfolio use as a tool for assessment and professional development in graduate nursing education. J Prof Nurs 2011;27:84-91. Timmins F, Dunne PJ. An exploration of the current use and benefit of nursing student portfolios. Nurse Educ Today 2009;29:330-41. Haggerty C. The challenges of incorporating ePortfolio into an undergraduate nursing programme. Open Praxis 2017;9:245-52. Clynes MP, Raftery SE. Feedback: An essential element of student learning in clinical practice. Nurse Educ Pract 2008;8:405-11. Chan ZC, Stanley DJ, Meadus RJ, Chien WT. A qualitative study on feedback provided by students in nurse education. Nurse Educ Today 2017;55:128-33. Solheim E, Plathe HS, Eide H. Nursing students' evaluation of a new feedback and reflection tool for use in high-fidelity simulation – Formative assessment of clinical skills. A descriptive quantitative research design. Nurse Educ Pract 2017;27:114-20. Zanchetta M, Taher Y, Fredericks S, Waddell J, Fine C, Sales R, et al. Undergraduate nursing students integrating health literacy in clinical settings. Nurse Educ Today 2013;33:1026-33. Sharif F, Masoumi S. A qualitative study of nursing student experiences of clinical practice. BMC Nurs 2005;4:6. Green J, Wyllie A, Jackson D. Electronic portfolios in nursing education: A review of the literature. Nurse Educ Pract 2014;14:4-8. Tsai PR, Lee TT, Lin HR, Lee-Hsieh J, Mills ME. Nurses' perceptions of e-portfolio use for on-the-job training in Taiwan. Comput Inform Nurs 2015;33:21-7. Dobrowolska B, McGonagle I, Kane R, Jackson CS, Kegl B, Bergin M, et al. Patterns of clinical mentorship in undergraduate nurse education: A comparative case analysis of eleven EU and non-EU countries. Nurse Educ Today 2016;36:44-52. Jack K, Hamshire C, Harris WE, Langan M, Barrett N, Wibberley C, et al. “My mentor didn't speak to me for the first four weeks”: Perceived unfairness experienced by nursing students in clinical practice settings. J Clin Nurs 2018;27:929-38. Helminen K, Johnson M, Isoaho H, Turunen H, Tossavainen K. Final assessment of nursing students in clinical practice: Perspectives of nursing teachers, students and mentors. J Clin Nurs 2017;26:4795-803. Webb C, Shakespeare P. Judgements about mentoring relationships in nurse education. Nurse Educ Today 2008;28:563-71. Brody AA, Edelman L, Siegel EO, Foster V, Bailey DE Jr., Bryant AL, et al. Evaluation of a peer mentoring program for early career gerontological nursing faculty and its potential for application to other fields in nursing and health sciences. Nurs Outlook 2016;64:332-8. Kalata LR, Abate MA. A mentor-based portfolio program to evaluate pharmacy students' self-assessment skills. Am J Pharm Educ 2013;77:81. Gordon CJ, Jorm C, Shulruf B, Weller J, Currie J, Lim R, et al. Development of a self-assessment teamwork tool for use by medical and nursing students. BMC Med Educ 2016;16:218. Hadid S. Factors influencing nursing student self-assessment in relation to instructor assessment. J Nurs Educ 2017;56:70-6. Kajander-Unkuri S, Leino-Kilpi H, Katajisto J, Meretoja R, Räisänen A, Saarikoski M, et al. Congruence between graduating nursing students' self-assessments and mentors' assessments of students' nurse competence. Collegian R Coll Nurs Aust 2016;23:303-12. Zamanzadeh V, Valizadeh L, Tabrizi FJ, Behshid M, Lotfi M. Challenges associated with the implementation of the nursing process: A systematic review. Iran J Nurs Midwifery Res 2015;20:411-9. Rahmani M, Alijani H, Dashtbozorge B, Haghighizadeh MH. Effect of the nursing process using via. J Clin Nurs Midwifery 2016;5:75-83. Lee E, Noh HK. The effects of a web-based nursing process documentation program on stress and anxiety of nursing students in South Korea. Int J Nurs Knowl 2016;27:35-42. Akbari M, Shamsi A. A survey on nursing process barriers from the nurses' view of Intensive Care Units. Iran J Crit Care Nurs 2011;4:181-6. Guadarrama-Ortega D, Delgado-Sánchez P, Martínez-Piedrola M, López-Poves EM, Acevedo-García M, Noguera-Quijada C, et al. Integration of the nursing process in the electronic health record in an university hospital. Rev Calid Asist 2017;32:127-34.